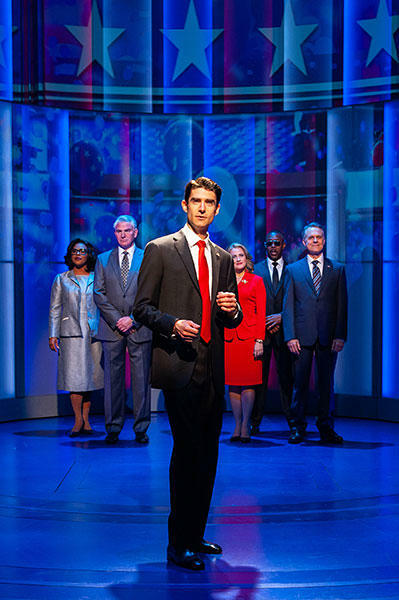 Drew Gehling and the company of "Dave"
Today our theater critic, J. Wynn Rousuck, joins Tom (a day earlier than usual) to share her take on the new political musical, Dave, now playing at the Arena Stage in Washington D.C. Directed by Tina Landau (SpongeBob SquarePants) and adapted from the 1993 Oscar-nominated film of the same name, Dave tells the story of Dave Kovic -- played by Drew Gehling (Waitress) -- a high school teacher with an uncanny resemblance to the President of the United States (also played by Gehling). Dave is recruited by members of the White House staff to stand in as the President's secret double when the Commander-in-Chief falls into a stroke-induced coma. As Dave struggles to manage the complex charade, he realizes that he must also gain the trust of the American people -- and the First Lady, played by Mamie Parris (School of Rock, Cats). Dave features a book by three-time Tony winner Thomas Meehan (Annie, Hairspray, The Producers), lyrics by Tony nominee Nell Benjamin, (Mean Girls, Legally Blonde), and music by Pulitzer Prize and two-time Tony winner Tom Kitt (Next to Normal, If/Then). Dave is playing at Washington D.C.'s Arena Stage, not far from the real-world inspiration for the production's Oval Office set. Performances continue through August 19th.